Florida Atlantic got a bit of revenge Saturday afternoon and set up a win-or-go home situation after taking down Rice, 7-4 Saturday afternoon in the 2018 Conference USA Baseball Championship, presented by The First. Third-seeded FAU (39-16-1) and seventh-seeded Rice will meet again in Saturday night’s final game at MGM Park. The winner earns a spot in Sunday’s C-USA title game. 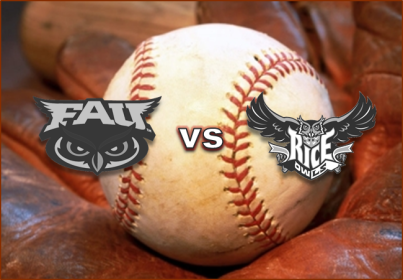 Rice beat FAU 5-4 Thursday in a second-round game, but FAU came back through the elimination bracket, knocking out second-seeded Louisiana Tech Friday before staying alive by handing previously undefeated Rice its first loss of the tournament. Rice led 1-0 before FAU put up four runs in the third inning. One runs scored on a wild pitch, another on a run-scoring single by designated hitter Jared DeSantolo and two more on a double by third baseman Joe Montes. But Rice loaded the bases off FAU starter Blake Sanderson in the sixth inning, and Ford Proctor’s double off the wall in right-center field cleared them and tied the score 4-4. FAU wasted no time coming back with two runs in the top of the seventh, with the tie-breaking run scoring on a double-play grounder. Left fielder Eric Rivera drove in the second run with a single. Rivera added an insurance run in the ninth with an infield single that scored shortstop Tyler Frank. FAU reliever Weston Clemente (2-0) picked up the win by allowing a hit before getting the last out in Rice’s big sixth inning. Matt Harris picked up his third save of the season by allowing just two hits over three shutout innings with three strikeouts as well. Jackson Parthasarthy (3-5) took the loss, allowing two runs on five hits over 4 1/3 innings. Montes had three hits for FAU and 2 RBI, with Eric Rivera also posting 2 RBI. Rice (26-30-2) got two hits apiece from right fielder Bradley Gneiting, third baseman Braden Comeaux and center fielder Ryan Chandler.